Welcome back to another Black Metal and Brews review of a new Venowl release. In addition to being an incredibly enjoyable group for me, they've got an obscene amount of releases for me to cover. While there are sections of their back catalog I'm still attempting to gather and share with you all, today's review focuses on a brand new EP, which is currently up for pre-order (and will be released on November 25th) on Ominous Silence. That's right, this is the first pre-release review and it's a fitting one. 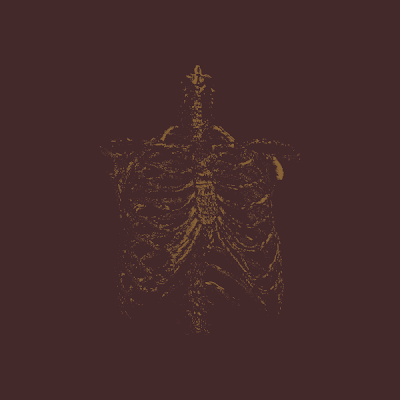 While the previously featured "Patterns of Failure" was an absolute nightmare of an album, with dense production only adding to the horror Venowl created, Gnawed Gristle and Bone has a clarity that shows the listener just how chaotic the music can get. This one song album opens with humming feedback and a glistening ambiance. This album was mixed by Garry Brents from Cara Neir and mastered by Mories from Gnaw Their Tongues, and it definitely shows. If you've ever heard the aural violence of Gnaw Their Tongues or the intensity of Cara Neir, you need only imagine how insane their involvement makes this album sound. As always, Venowl create some of the slowest, most violent music I've ever heard. The shrieks of anguish are no longer buried in the mud. They're now at the forefront of the music, creating an agonizing sense of terror. Every time the song starts to form a listenable pattern or some sort of groove, the band intentionally takes the song out of what could become a comfortable territory and steers it into a new variety of noise. The guitars churn at some of the lowest frequencies possible, providing more of a grinding sound atmosphere more than a collection of riffs. There are no melodies here for you to hum with, there is no hope of escape. Halfway through this twenty-three minute long torture ritual, some sort of keyboard or choral atmosphere creeps into the background. Instead of providing a sense of comfort, it only adds another smothering layer to the discomfort Venowl revel in. This album's title and sound evoke the sensation of being a live animal on some sort of factory farm, being forcefed into machinery to be packaged and sold as meat to others. You can hear your own heart beat heavily with anxiety. Your breath becomes deep and slow. It almost feels like being hunted. As always, Venowl are the sort of band who are best described in sensations rather than familiar musical terms. Any attempts at giving this a proper categorization will only give the listener a preconceived understanding that will inevitably fall short. If you like music that might cause your bowels to evacuate, give this a listen. This is definitely a more developed work than some of the material I've heard from Venowl in the past, although it is no more sterile or safe than anything else they've created. If anything, this is the sound of a band who is becoming an incredibly efficient killing machine. This is by far the most unsettling release I've heard all year and I expect it to be even more gripping when it's released in physical format. There will be 75 grey cassettes released, each with a burgundy/maroon o-card sleeve with letter-pressed artwork, and given this label's commitment to high quality small run releases, I anticipate it will sound incredible.